In the past, I have written about how necessary it is to treat writing seriously and build a writing practice. Making time for writing within your everyday life is absolutely essential, but finding the time is only part of the challenge. The other part is establishing your own writing ritual. Ritual may not be the best word choice, but I think it gets at the core of the idea I am trying to express. Every writer is different and they approach their writing in their own way, develop their own habits and techniques. 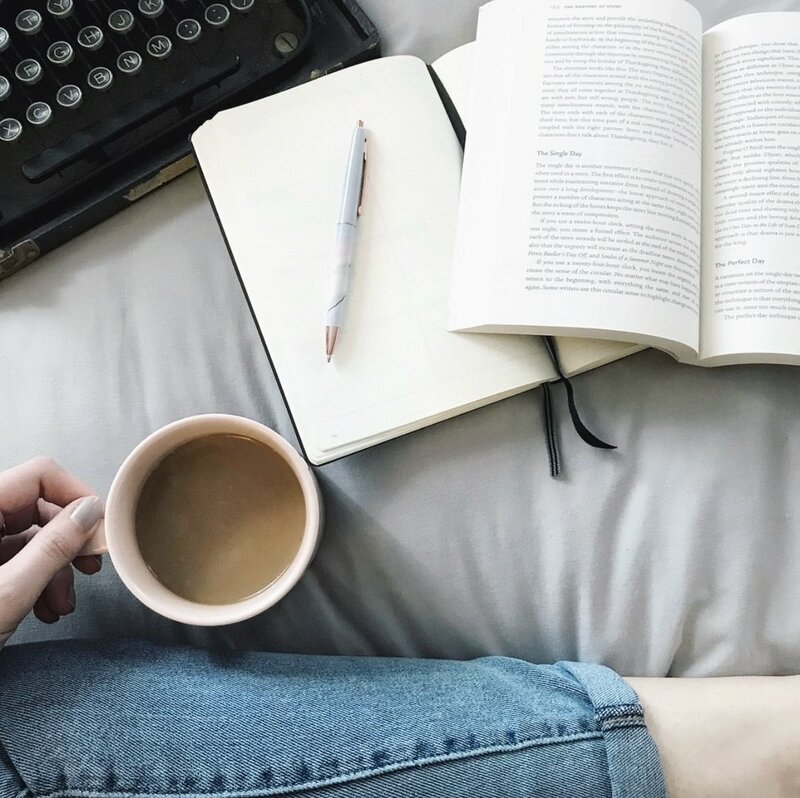 When I say writers should establish their own rituals, I don't mean that every condition must be just so in order to write, rather it is about finding out what works best for you so that you can do more of what works and less of what doesn't. Some people are early birds and some people can barely get up in the morning without 3 cups of coffee and a seriously loud alarm clock. Writers should figure out when they do their best work. Maybe you like to write after work with a glass of wine or maybe you like to knock out your writing first thing with a big cup of coffee on hand. Try out writing at different times and see what works for you. Of course, life can get in the way and you may not always be able to write at your ideal time, but I think it is worth figuring out when you work best and if there is a way to build that writing time into your daily schedule. If you aren't familiar with the terms, I have a post on plotters and pantsers, but it comes down to whether you plan your writing or not. Books on writing craft set this up as the basic dichotomy of writers: you plan or you don't. Of course, nothing is ever so black and white, and you can do a little of both. However, if you aren't quite sure where you fall, I'd recommend trying different levels of planning. Try free writing, try making a basic outline, try planning out all the important plot points and scenes. Once you figure out how you write best, you can streamline your writing process. Writing is something that you can do just about anywhere. Some like to write in busy cafes or in a quiet library or at home at their very own desk. I personally like to write at home. I can wear whatever I want, can set the atmosphere however I want to, can talk through my dialogue, etc. without feeling embarrassed or self-conscious. Others, however, like the hustle and bustle of a cafe or restaurant, or the quiet shuffling of pages in a library. Whether you like to be surrounded by other people or on your own, figure out what places you enjoy writing in. Recently, there was even a story about a woman who wrote her entire novel at a car service center. Find the place that works for you! This goes a bit hand-in-hand with the last point. Find an atmosphere that is conducive to your writing. I like to light some candles, turn on some music, and get a cup of coffee or a glass of wine ready to go. Some like to write in silence, others like background noise or music. Try different things until you find what works for you. I personally love to listen to classical music and movie or tv soundtracks while I'm writing (I did an entire post on this if you are interested in some music recommendations!). Mostly, this is about getting into a place where you are comfortable and can focus. Avoid any places or atmospheres that make you feel tense or anxious. Finally, figure out exactly how you like to actually write. Do you like the nostalgic feel of writing a novel out by hand into a notebook? Maybe you just type it into Microsoft Word? Recently, I've been using Scrivener because it offers more tools to organize chapters and scenes, as well as background research and notes. I've also used ZenWriter, which is a great option if you are easily distracted and want a no-frills writing experience. Most of us write on our computers now, but if you prefer clacking away on a typewriter or scratching out each word with a fountain pen, go for it. Of course, the stars won't always align and you may not be able to write exactly how you want to, but it is useful to know what works for you. Even if you can't write at your ideal time, maybe you can still write in a place you like or turn on music that inspires you. Creating a writing ritual isn't absolutely necessary, but it can help you establish a regular writing practice that is both productive and enjoyable.